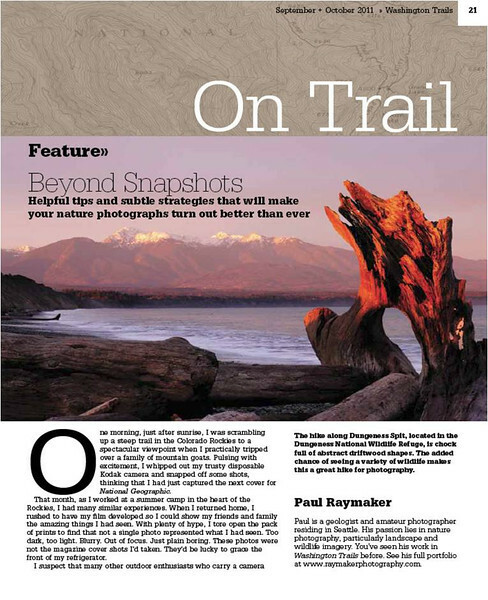 Check out my first full length feature article in the September+October Washington Trails Magazine! I discuss some simple helpful tips on how to go beyond your average snapshot on the trail. This article, as well as the one described below are all downloadable PDFs, so download them to your computer or iPad and give'em a read! If you are a Pac Northwest hiker, check out this featurette highlighting some of my favorite Golden Hour hikes. If you are an avid hiker or backpacker who is looking for some tips on light gear, you should check out this article. In it, I have a sidebar of tips on how to lighten your photographic load with things such as a good, solid, carbon fiber tripod.